The Auroville Today report on Ashram affairs in the issue of October, 2013 is a “thoroughly researched” (!) presentation of facts by a lawyer who has been given the job of defending the Sri Aurobindo Ashram Trust. He has therefore necessarily presented only one side of the story and has left out all the events and documents that are not compatible with his whitewashed picture of the Ashram Trust. 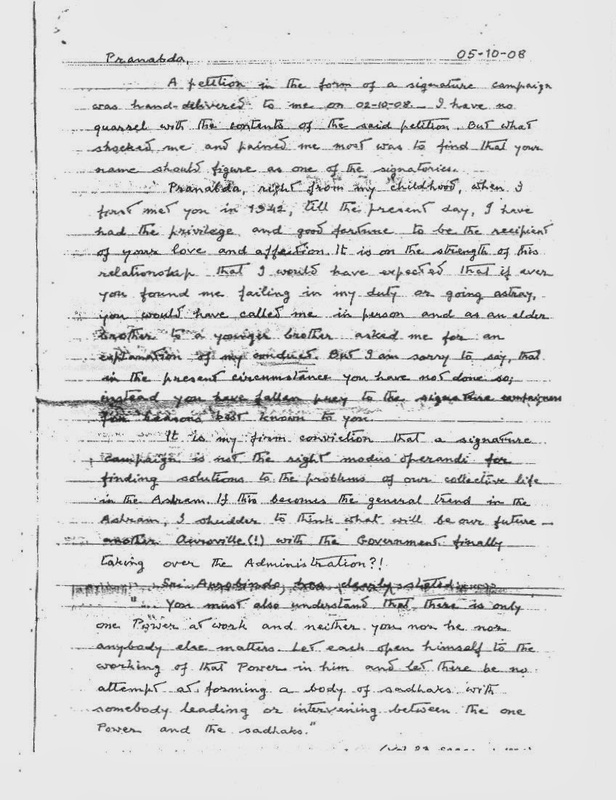 The foundation of his thesis is predetermined: the Trustees are angels fallen from the sky and those who are protesting against them are hostile forces attacking the Mother’s work. In that case, Auroville should also be considered as part of that falsehood because the Mother had originally given the task of building Auroville to Sri Aurobindo Society and not to those who rebelled against it and brought about a Govt. intervention! Navajat Poddar has indeed been so much demonised by Aurovillians that I would now like to believe that he was the Mother’s instrument! Why don’t the Aurovillians don’t even mention him as the man who first proposed Auroville to the Mother, who then used him as an instrument to execute it? It is high time that he should be given due credit for his role. I will quote below some of the salient passages in the Auroville Today report and give my response. Auroville Today: The stand of the Ashram trustees to the book and the proposed expulsion of Heehs has been consistently unambiguous. “The Sri Aurobindo Ashram Trust does not project itself in the role of dictating to readers and followers of Sri Aurobindo as to what they should read and what they should not read. Each person is at complete liberty to decide for himself whether he finds any book to be meaningful and useful, or whether he does not find it to be so, and Sri Aurobindo Ashram Trust respects and has full faith in the intellectual and spiritual discernment of the readers. 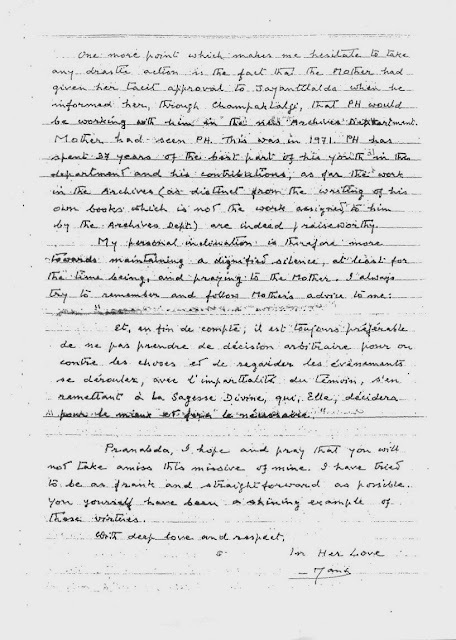 No one should or needs to force his personal opinions on any other reader in general, and more particularly on the followers of Sri Aurobindo,” wrote Dr. Datta, Trustee, Sri Aurobindo Ashram Trust, in a statement given to the Press. And he added that the issue whether the author of the book, who has been in the Ashram since the year 1971, can stay in India or not is a matter that is entirely and exclusively within the purview of the Government of India. This is indeed laughable. 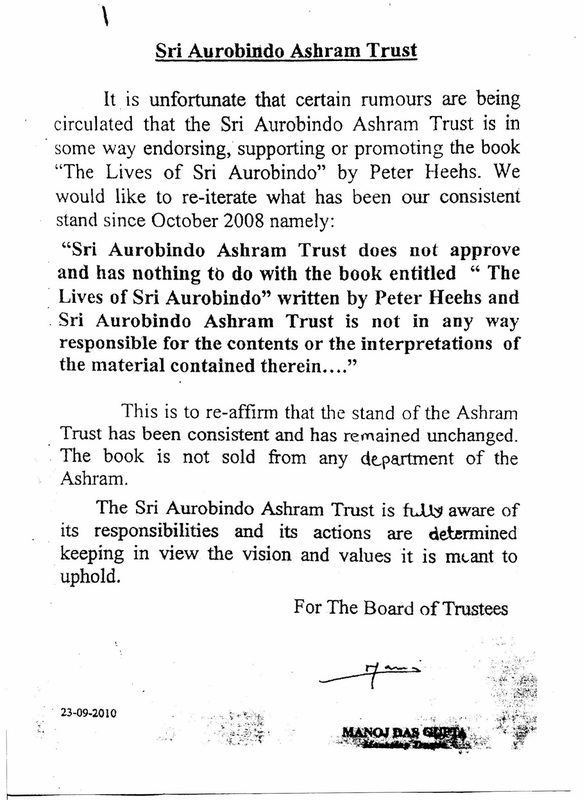 If the stand of the Trustees with regard to the Lives of Sri Aurobindo by Peter Heehs is “consistently unambiguous” and leaves it entirely to the discretion of the readers and followers of Sri Aurobindo, then why was there such a flip flop on the issue? 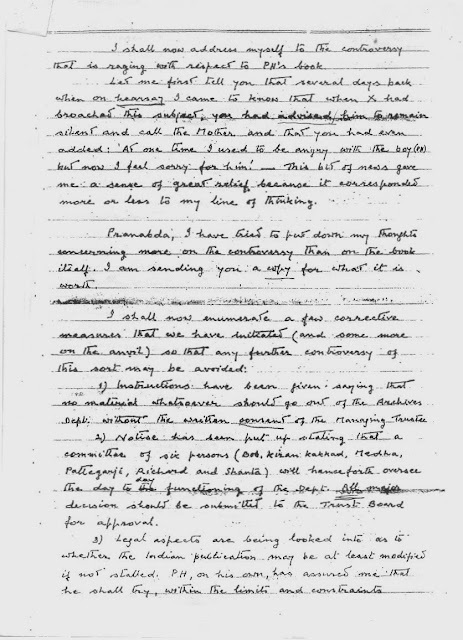 I will list below passages from a series of documents which show that the Trust strongly disapproved of the book. 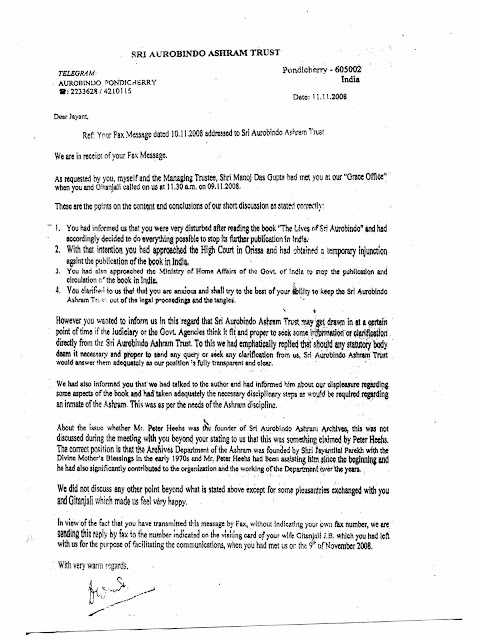 Letter of Manoj Das Gupta, the Managing Trustee, to Pranab Kumar Bhattacharya on 5 October, 2008; a copy of the letter is available in MDG’s own handwriting. This is to re-affirm that the stand of the Ashram Trust has been consistent and has remained unchanged. The book is not sold from any department of the Ashram. The Sri Aurobindo Ashram Trust is fully aware of its responsibilities and its actions are determined keeping in view the vision and values it is meant to uphold. 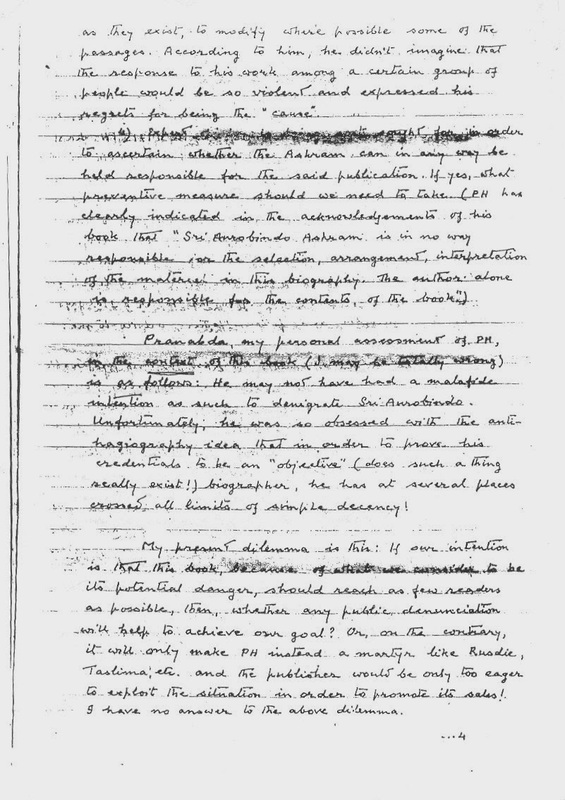 All the above four documents have been wilfully omitted by the writer of the Auroville Today report! Why? Because he does not want to show that Peter Heehs was in the bad books of the Trustees despite all their show of neutrality. 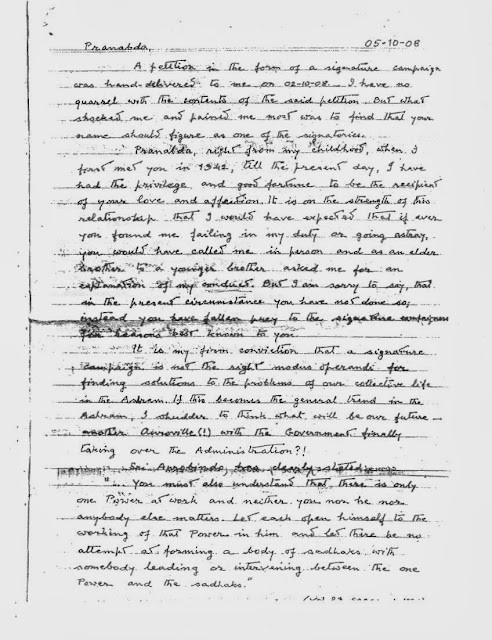 For the information of Aurovillians, Peter Heehs was also removed from the Archives Dept where he had been working since the last four decades, and a new editorial board was put in place in order to continue with the publication of Sri Aurobindo’s works – this new arrangement continues till date. The Trust could have publicly supported the book if it approved of it instead of keeping people guessing about its stand. In fact, the joke that went around the Ashram at one point of time was that Manoj Das Gupta found the book admirable in the morning and deplorable in the evening, depending upon, I suppose, as to how much sugar he put in his morning and afternoon tea. The neutral public stand that the Trust has taken with regard to Peter Heehs’s book is merely for self-defence in the Court and to deceive the general public, especially the Westerners, with a false kind of secularism. The real question is not as to whether the Ashram is a religious or spiritual institution, but as to whether the Trustees can take a stand against the interest of the very founder of the institution, be it religious, spiritual or secular. Had the Trust openly supported the book, it would have gone against the ban of the Orissa Govt, in which case it would have been liable to breach of Trust. Had it openly condemned the book, it would not have remained in the good books of Peter Heehs and other likeminded Westerners. Moreover, the liberty the Trust professes to give to all inmates is only to exonerate Peter Heehs, for it otherwise took strong action on all those who criticised the book. R.Y. Deshpande and Radhikaranjan Das were removed from the Higher Course of the Ashram School; Sraddhalu Ranade, Niranjan Naik, Sudha Sinha and Ramnathan were removed from their place of work; Togo Mukherjee and others were deprived of their food coupons in the Ashram Dining Room; and show cause notices were issued to eight more inmates of the Ashram for going public on the issue. The Auroville Today report has not mentioned a single case of these highly repressive measures the Trust has taken on its own inmates and other beneficiaries. Such actions in Auroville would have caused a furore, but in the Ashram it only instilled fear of the authorities, which is exactly what the Trustees wanted! 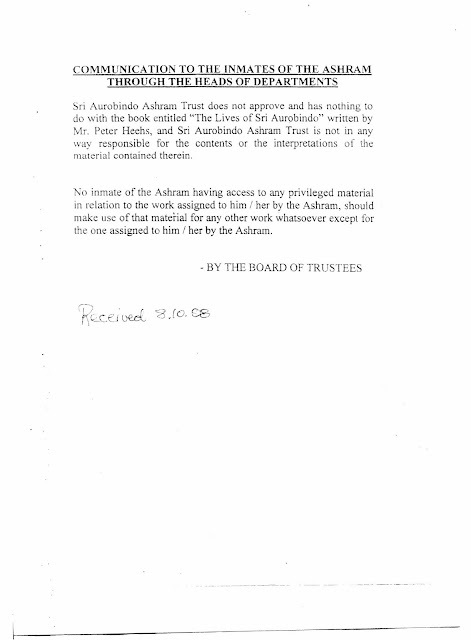 Note that the emphasis is on depriving “a foreign member of the Ashram of the privilege of residing in India”, and not on the book of Peter Heehs. So if tomorrow the Indian Govt. deprives a foreigner the privilege of staying in India for legitimate reasons, the Govt. would be in the wrong! Is this not a blatantly racist argument? And is not the Working Committee foolish enough to make it blatantly appear so, without the least trace of discretion? After all, in Auroville you are supposed to think in more universal terms, and not with respect to only foreigners and their visas? On the other hand, the same Working Committee bars the freedom of speech of a highly educated Indian, who only wanted to explain to the Aurovillians how the book denigrated Sri Aurobindo and how it was not good for Auroville in general! Are these not double standards? The document reproduced below proves to what extent the Ashram management is hand in glove with some of the Aurovillians. The suit filed by several Ashramites at the Puducherry court is a so-called leave petition, required under the Indian Code of Civil procedure. On Tuesday 5th the court will meet and decide whether it allows the petition (i.e. 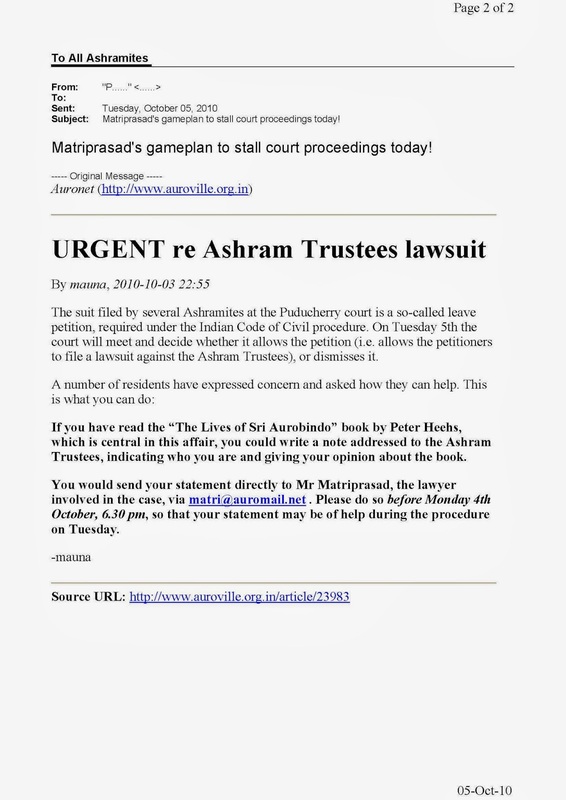 allows the petitioners to file a lawsuit against the Ashram Trustees), or dismisses it. If you have read the “The Lives of Sri Aurobindo” book by Peter Heehs, which is central in this affair, you could write a note addressed to the Ashram Trustees, indicating who you are and giving your opinion about the book. 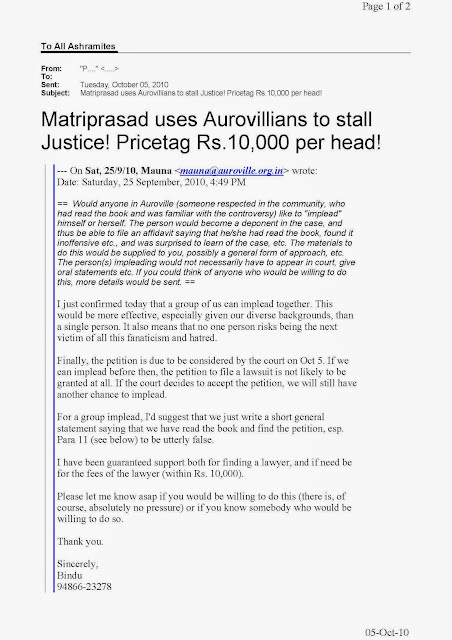 You would send your statement directly to Mr Matriprasad, the lawyer involved in the case, via matri@auromail.net . Please do so before Monday 4th October, 6.30 pm, so that your statement may be of help during the procedure on Tuesday. 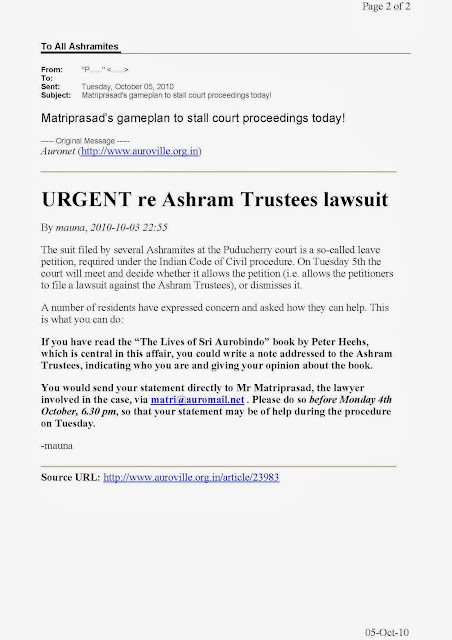 The above document is a leaked email of Mauna in October 2010 telling other Aurovillians to send a statement to Matriprasad, the secretary of the Ashram Trust, to help him dismiss the Scheme Suit filed against the Ashram Trustees. This naturally implies the complicity of Matriprasad. But then why did the Trust take a neutral position in the Court while asking at the same time for positive comments from others on the same book? Why did it quote mostly positive reviews of the book while not declaring its own position? And what about the circular it sent to all the departments of the Ashram in October 2008 (Document 2) and the notice it put up on the Ashram notice Board in September 2010 (Document 4), both of which clearly state that it did not approve of the book? In the light of the above information, is there still scope to say that the Trust’s position was always “consistently unambiguous”? I would rather use the words “consistently devious and deceitful” to describe the stand of the Trustees right from the beginning the controversy. The fact that Sri Aurobindo Society always maintains a dignified silence in the face of such nasty statements repeated ad nauseum by some of the Aurovillians should itself teach them a little humility and the need for introspection. Events in Auroville after the Mother’s passing away were far more complicated than the simplistic picture presented by these Aurovillians as the biblical truth. Both sides can be equally accused of heavy handedness and harsh methods! If the Aurovillians were harassed by villagers sent by Sri Aurobindo Society as has been alleged, then the Aurovillians were no less cruel in evicting people from their houses and throwing out the belongings of those who supported the Society or even remained neutral in the conflict. Not many people know that a number of cases were filed against them with the Police of Tamilnadu, all of which were withdrawn later. So both sides were not angelic in their behaviour! As a matter of fact, many of the early settlers were deeply disillusioned about Auroville during this period of conflict and left it for good. In any case, when the Society has reconciled itself to these unfortunate mishaps of the past, why don’t the Aurovillians also forget and forgive instead of taking every opportunity to take a swipe at it? After all, the Society has over 16000 members enrolled with it and has hundreds of centres around India and the world, where people only aspire to serve Sri Aurobindo and the Mother, and for whom differences between Auroville and Sri Aurobindo Society don’t matter at all. Finally, I would like to remind the Aurovillians a millennium old truth, that any institution, be it Auroville, Sri Aurobindo Society or Sri Aurobindo Ashram, is only a means and not an end in itself! From that point of view a remote little shack in Ghana (where the flame of spiritual aspiration has been lit) should be treated with equal respect as these long standing institutions! So I request the editors of Auroville Today to stop making these jingoistic statements, come down to more earthly realities and take a sober look into the past as well as the present. Otherwise the future generations will laugh at them despite all their pretensions!